Disaster Management, Organizational Accidents and Crisis Sciences for Sustainability. This is the first book to examine the linkages among natural and organizational accidents and disasters in the modern era and clarifies the mechanisms involved and the significance of emerging problems, from the aging of vital infrastructure for the supply of water, gas, oil, and electricity to the breakdown of pensions, healthcare, and other social systems. The book demonstrates how we might check the underlying civilizational collapse and then explore translational systems approaches toward resilient management and policy for sustainability. 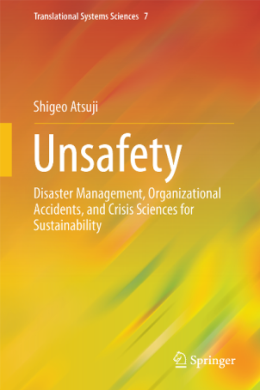 In Unsafety, the author focuses on the kinds of unnatural disasters and organizational accidents that arise as repercussions of natural hazards. Japan serves as an example, where earthquakes, tsunamis, and typhoons are common, with the Fukushima nuclear disaster as an outstanding case of this link between natural disasters and organizational accidents. Natural and human-made disasters happen worldwide and cause misery through loss of life; destruction of livelihoods as in agriculture, fisheries, and the manufacturing industry; and interruption of urban life. Unsafety from a disaster in one place increases uncertainty elsewhere, presenting urgent issues in all nations for individuals, organizations, regions, and the state. The author explains that one factor in the Fukushima catastrophe, which followed in the wake of the earthquake and tsunami in 2011, was the latent deterioration and aging of systems at all levels from the physical to the social, leading through a chain reaction to unsought and unforeseen consequences. Here, the aging of the nuclear reactor system, the breakdown of safety management, and inappropriate instructions from the regulatory authorities combined to create the three-fold disaster, in which technological, organizational, and governmental dysfunction have been diagnosed as reflecting a “systems pathology” infecting all levels. Please cite our homepage un-safety.net when using the figures, tables and data shown there.